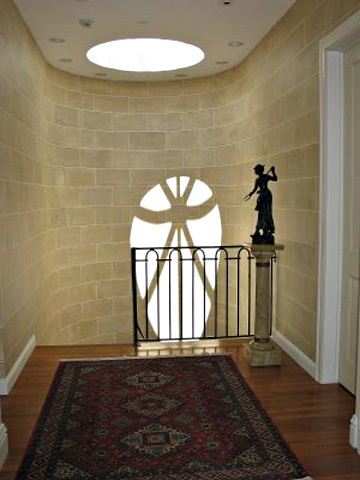 This was a fairly involved project which included an inner and outer entry hall, stairwell and upstairs hall. The clients had a very clear idea of what they wanted which made my job much easier. The ceiling in the stairwell was about 20 feet about the bottom step of the staircase, so some cleverly installed scaffolding was necessary. The paint has a grit-like substance added to give it the look and feel of real stone. I think the before and after photos speak for themselves.